K-pop act BTS’ dream has become a reality, topping the Billboard 200 chart only a few days after the group named it as one of its goals. On Sunday, the group’s “Love Yourself: Tear” album, its third full-length album, ranked No. 1 on the Billboard main albums chart, making the seven-piece K-pop powerhouse the first K-pop act to do so. 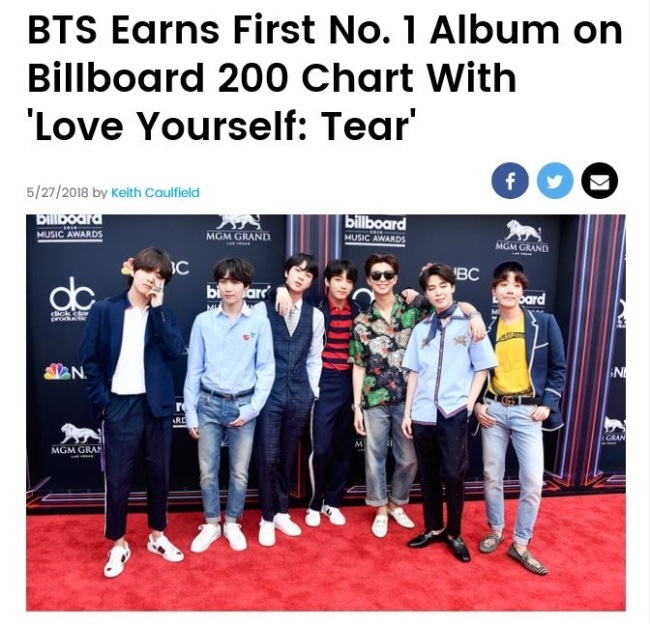 “Love Yourself: Tear” album, performed mostly in Korean, is the first non-English album to top the chart in over 12 years since the record set by crossover vocal quartet Il Divo’s “Ancora” in 2006. It is also the second K-pop album to enter the chart’s top 10, following BTS’ own “Love Yourself: Her” album that peaked at No. 7 in October last year. “Love Yourself: Tear” sold more than 1 million copies within the first week of its release on May 18. Its lead track “Fake Love,” a moody hip-hop track, delivers the members’ realization that what they once believed to be true love was a sham. The album also features experimental tracks like “Airplane pt. 2,” the band’s first take on Latin-pop, and “134340,” a quirky hip-hop piece that features the most dynamic tunes in BTS’ history. Formed in 2013 by K-pop label Big Hit Entertainment, the band, consisting of RM, Jimin, Suga, J-Hope, Jin, V and Jungkook, shot to international fame in 2016, when its second full-length album “Wings” broke records as the highest debut by a K-pop album in the US. Just one year later, the band earned its first US Billboard Hot 100 entry with the smash hit “DNA” at No. 85. The song later became the highest-charting K-pop group song, peaking at No. 67. BTS on May 21 won the Billboard Music Awards’ top social artist award for the second consecutive year. 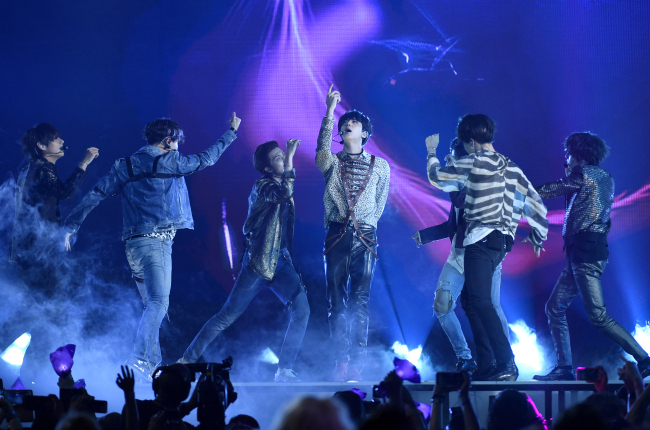 It also performed the world premiere of its “Fake Love” during the awards show at the MGM Grand Hotel and Casino in Las Vegas. The band recently kicked off its promotional activities in Korea by holding an Mnet showcase on May 24. The Billboard 200 chart ranks the most popular albums of the week in the US based on multi-metric consumption, which includes traditional album sales, track equivalent albums and streaming equivalent albums, according to the magazine. 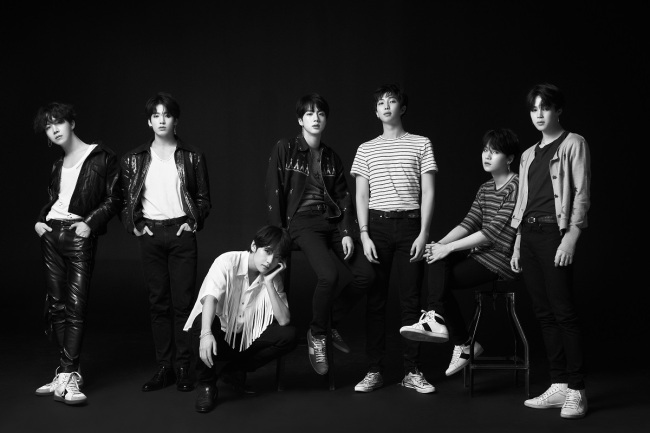 It added that the set, which was released through Big Hit Entertainment on May 18, launches with 135,000 equivalent album units earned in the US in the week ending May 24, according to Nielsen Music. Of that sum, 100,000 were in traditional album sales. With the K-pop act on the No. 1 spot, Poss Malone’s “Beerbongs & Bentleys,” dropped to No. 2 after three consecutive weeks atop the list.